Falconer display was a big attraction at the 38th Felix Neck fall festival. 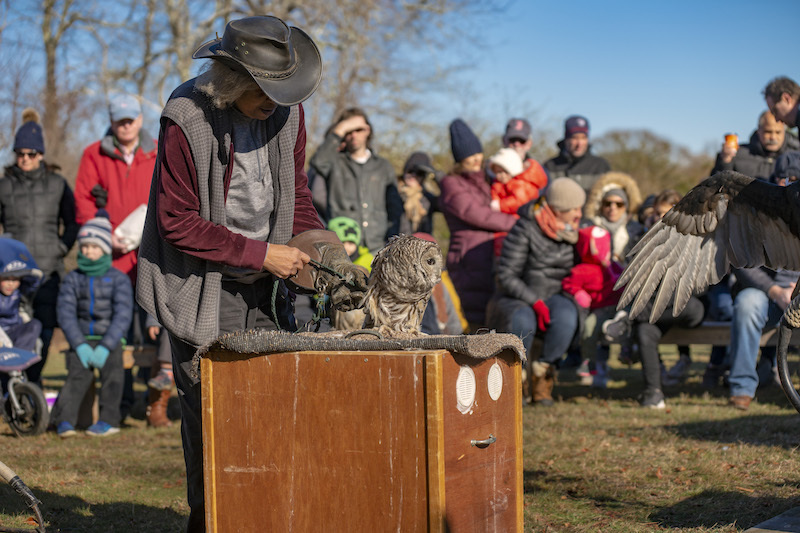 Hundreds of Islanders and visitors flocked to Felix Neck Wildlife Sanctuary in Edgartown Friday for the 38th annual fall festival. Bundled to the chins, everyone dressed for the cold on a bright sunny day after Thanksgiving, and chili was a hot seller at the food tables. Andrea Harris of Boston and her mom Pamela took part in the popular squash bowling booth, using pumpkins as bowling balls to knock over butternut squash pins. Across the field, a large crowd took in a display of birds of prey. Not far away, kids roasted marshmallows over an open fire of split pine logs. Sue Streeter of Oak Bluffs was helping visitors make holiday wreaths, though before the festival really got started, she made one for herself. “Isn’t this great,” she said, holding up her creation. The base of the wreaths is an interwoven circle of bittersweet vines. Visitors were adding fresh greens and flowers to the base. She explained that bittersweet is an invasive vine, so the volunteers are careful to remove any buds so the species can’t spread in a new location. She said she was having fun helping visitors create something new and home made. 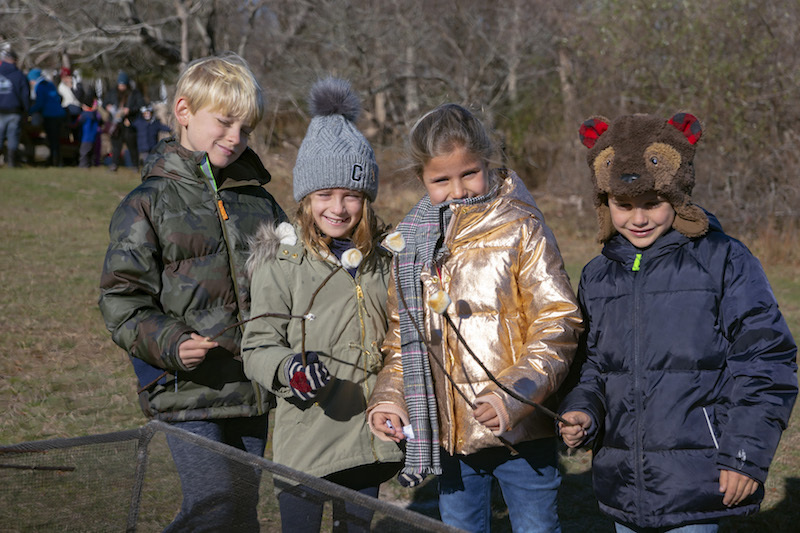 In still another part of the field, kids were hurrying to finish making bird feeders, so they could get on the next hay ride around the Felix Neck trails, pulled by volunteer Alan Gowell on a new orange Kubota tractor recently donated to the nonprofit group. Suzan Bellincampi, executive director of the sanctuary, said the fall festival is an alternative for the madness of mall shopping on the day after Thanksgiving. 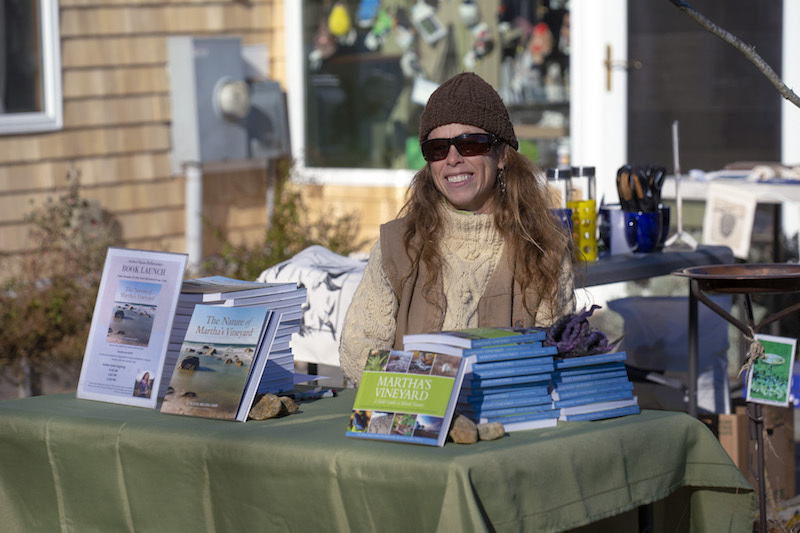 Ms. Bellincampi also has a book just out that is a collection of her natural history essays, illustrated by photographer Timothy Johnson.